In recent years, the effort to use native plants has become a subject of such great controversy among the landscape architecture community that it’s become something of a flashpoint, a source of such disagreement that merely hearing the words ‘native’ and ‘plants’ in the same sentence can cause reasonable, seasoned professionals to curl their lips in disdain. New York Landscape Designer Diana Drake hopes to use this opportunity to share why she considers it important, from an ecological standpoint, to use native plants, and to talk about some of the differences inherent in designs that take advantage of using them. Diana Drake has worked as a landscape designer for two decades, managing large and small public projects with the firms of Judith Heintz Landscape Architecture and Wallace Roberts & Todd in New York City, specializing in selecting the best-suited plants for outdoor spaces, whether campus, park, public plaza, rooftop garden or residential property. Since 2013 she’s been working cooperatively with Judith Heintz and Napat Sitisara as sassafras55. Her commitment to using native plant species deepened as she taught planting design at Columbia University with Darrel Morrison, adding to her earlier stint at the Center for Plant Conservation, and her hands-on training at Harvard’s Arnold Arboretum. With sassafras55, Ms. Drake currently is involved with the all-native plantings of East Midtown Plaza in Manhattan, the Queens Borough Municipal Parking Field, and the Kearny Point Industrial Park Landscape in New Jersey. Throughout this entire period, she’s been learning first-hand via her experiments in her garden lab in Old Lyme. She holds a Masters in Landscape Architecture from Harvard Graduate School of Design. This Essex Library program is free and open to the public. Centerbrook Architects is located at 67 Main St. in Centerbrook. Please call the Library at 860 767-1560 to register or for more information. Kicking off this year’s series of 8 speakers will be landscape designer, Louis Raymond with “More Colorful Than Ever” on Thursday, October 4th at 7 p.m. at the Essex Town Hall. For Raymond, who is featured in the current issue of Design New England magazine, a garden represents something transcendental: “A great garden is like a great life: Both are a collage of broad exuberance, attention to detail, occasional bravery, more-than-occasional naps, and plenty of experiments. 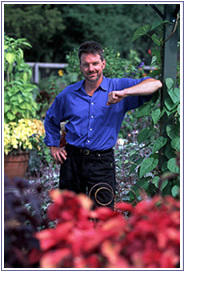 Both balance a respect for tradition with regular and even gleeful assaults on that same tradition.” This lively presentation chronicles Raymond’s thirty-plus years exploring color in his life and his garden. Does blue really go with red? Apricot with pink? Parchment with white? And what plants best bring which colors to the garden. Raymond has been gardening for over 50 years, ever since, as a pre-schooler, he “borrowed” a number of geraniums from public gardens across the street from the family home. While he has always had a fondness for plants and gardening, Raymond took the scenic route to his current vocation. By the time he was 25, he had already earned baccalaureate degrees in chemistry, piano, and voice – and still found time for a couple of years of medical school along the way – before launching successful careers as an opera singer and a freelance writer. By 30, he had retired from both to take up the trowel fulltime.For more information on Louis Raymond, visit www.RGardening.com or www.LouisThePlantGeek.com. Many of the Centerbrook Architects Lecture Series talks for 2010-2012 can be viewed on YouTube. Links to the films are on our Lecture page here.